Can Millennials Afford Homes in Denver? Rents are climbing in most major cities across the country, driving more folks to consider buying homes sooner than their initial plans. By purchasing a property, renters begin investing their monthly payments into the equity of their homes rather than losing that money each month. The widely-accepted housing affordability guideline is to spend no more than 30 percent of your income. Currently, renters pay 30.1 percent of their incomes on rent each month, while homeowners pay just 15.3 percent on their mortgage payments. In Denver, those values are even costlier. Denver renters pay 33.4 percent of their incomes and homeowners pay 19.8 percent each month. In fact, rents in Denver are up 10.6 percent in the last year. Clearly, buying is the better financial option for monthly savings, but owning a home costs more than the monthly payment. Buyers need to prepare for the down payment, closing costs, property taxes, homeowners insurance and annual maintenance costs. Homeownership is expensive, but it’s still the American dream and many millennial-aged folks are beginning to consider the transition to avoid rising rents. But, can they afford it? Millennials are between the ages of 23 and 34 years old and are generally some of the lower earners nationwide because of their youth. Unfortunately, incomes have not kept up with rising home values in the real estate market. Since 2000, incomes only rose 15 percent among the lowest third of U.S. workers. Meanwhile, home values appreciated 41 percent. From that perspective, low-earners would be strapped to find affordable inventory. However, the facts prove that millennials can afford much of the available inventory. The median income of millennials in Denver is $56,843. Assuming these millennials could afford a 5 percent down payment and spend 30 percent of their monthly income toward a mortgage payment with a 3.98 interest rate, then Denver-based millennials could afford nearly half of the homes on the market. The potential price of homes they could purchase would be $313,299, freeing up 46.3 percent of the inventory. Zillow found the total number of for-sale listings at that price point going back to 2010; of all 6,577 listings in Denver, a millennial could afford to buy 3,045 of the properties. Although affording half of the market seems reasonable for a lower-earning group, it’s well below the national affordability rate of 69.7 percent. 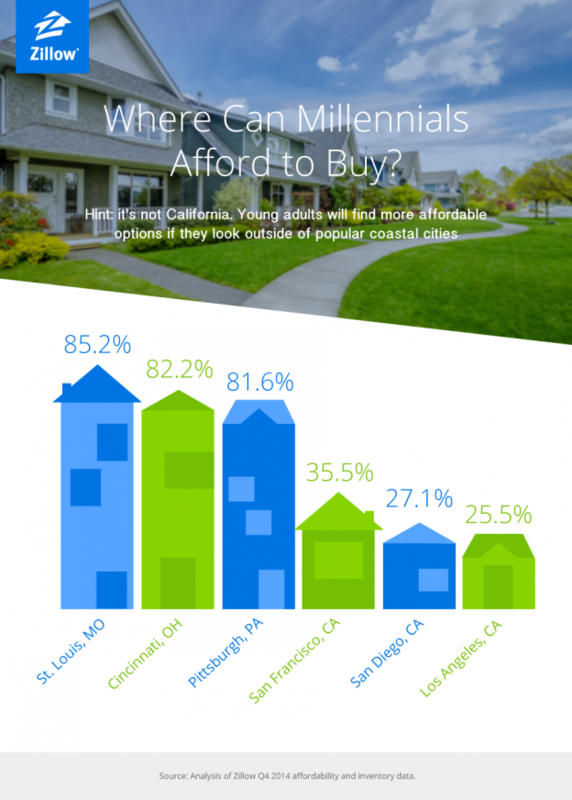 Across the country, millennials can afford far more of the for-sale market, but their median income is lower at $49,176, and their purchase price is less too ($271,041). Denver is a hot sellers’ market for 2015, ranked third in fact. Buyers battle for inventory and sellers can get away with steep prices because the inventory is low compared to the demand. And the demand doesn’t seem to be calming anytime soon. According to the Zillow Housing Confidence Index survey, 19 percent of 18- to 34-year-old renters plan to buy in the next year. The survey indicates 29,000 millennial buyers will emerge in the Denver market within the year. If renting is becoming too pricey in the Denver area and you’re considering buying instead, review the for-sale listings and keep the 30 percent guideline in mind. First-time buyers with good credit can offer 5 percent or even 3 percent down to ease the upfront costs of financing a home purchase – some loan options even allow zero down. Start shopping now to get an idea of the inventory and value before bidding in the competitive Denver market. This entry was posted in Real Estate and tagged colorado real estate market, Denver Real Esate Market on June 11, 2015 by Stephanie Iannone.